According to research from sales expert CSO Insights, salespeople spend only 37% of their time actually selling and interacting with customers. While that number seems alarming, it makes sense when you consider their other tasks – pre-call planning, account research, prospecting to secure meetings, training, internal meetings and administrative responsibilities. With such a constrained amount of time actually selling, sales leaders often ask themselves, “Is my team focusing their time and attention on what will drive maximum impact?” If finding and securing new customers is a high priority, are your salespeople spending the optimal amount of time securing meetings with prospective new customers? If you’re like most high growth sales leaders, you probably feel your team could be a bit more optimized. Your experience knows there is always room for improvement, and very small tweaks in productivity can have a profound impact. To bring this idea to life with some hard data, let’s take a look at this scenario of hunting down new business. Let’s say you have 100 salespeople and the average salesperson secures $500,000 in new business per year. If your average contract value is $25,000, that’s 20 individual sales wins. Then let’s assume you have a 25% close rate. So a salesperson needs to go find 80 new opportunities during the year in order to get those 20 wins. Sure some salespeople are more efficient than others, but you need to use some kind of assumptions to plan your business correctly. Okay, so what does it take to find those 80 opportunities? Well, they need to go get meetings! So let’s assume that on average, a new business salesperson has 40 conversations per month with prospects, and that 25% of those are specifically initial intro meetings. The other 75% are follow-up meetings, delivering proposals, negotiating, etc. Anything related to advancing an already identified opportunity. That’s 10 initial intro meetings per month per salesperson, or 2 to 3 per week. So we’re not talking crazy numbers here, and especially if you’re a company focused on growth, you need to make sure your team is executing on the basic day-to-day activities so you can deliver on your your strategy to find new business. If a salesperson has 10 of those initial intro meetings each month, about how many of them result in a real sales opportunity? If we assume that those prospects took the meeting because there was some level of interest, or your marketing team did a great job setting it up as a qualified lead, then the conversion should be pretty high. Let’s be conservative and say 50%. So those 10 intro meetings turned into 5 new sales opportunities. Put all that math together, and there’s your execution plan to hit your sales numbers — each salesperson needs to get 10 new business meetings per month. If they do that, which is a very top of the funnel of activity for a salesperson, things should generally fall into place. But what if you’re questioning if your team really is consistently securing those 10 meetings each and every month? Or what if you want more? What if you could squeeze just a little more efficiency out of your salespeople by getting them more focused on these new business intro meetings? In the exercise above, I chose to identify that new business intro meetings is a very specific behavior that needs to happen. There are a ton of moving parts in any sales process – like having a good product to maximize deal size, training to maximize close rates, etc. But when a company looks back and realizes that they didn’t get the new business growth they wanted, the root cause they identify is often very simple: the sales team wasn’t proactively prospecting enough to get meetings. This is basic blocking and tackling in sales, but is a crucial item to any high growth company. Taking the above scenario, what if you could simply increase your teams focus and efficiency on securing more of those new business intro meetings by 15%? So instead of 10 new business intro meetings per month, they get 11 or 12. Nothing crazy here – just a small nudge to get people focused on the right behavior. Just as an example, our clients at Kelly Services, Dyn, FireHost, Tapjoy and Varsity Spirit have seen 30% to 130% increases in those new business meetings, so 15% is a conservative estimate. The impact is astounding… based on our assumptions on converting the first meeting to an opportunity, close rates and deal size, that simple increase in new business intro meetings (1 to 2 per month per rep) would result in $5.6 million in new business! That’s the equivalent of hiring 11 more salespeople! It’s actually even more than that if you consider that you probably need to hire 20 salespeople to get 11 productive ones, which requires staff to train them, three to six months to onboard them, etc. — which means it would actually take months to see those results. You can make this simple little turn of the dial on your EXISTING sales team which means no crazy planning, team meetings, training, marketing collateral, etc. Just create a little visibility and collaboration around this behavior and the impact will be astounding and immediate. 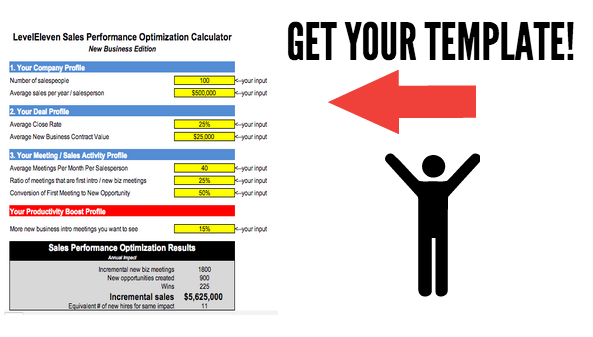 Download the New Business Version of our Sales Performance Optimization calculator so you can plug in the calculations for your team to see what this can do! Check out this sales hack (and free template) that will help launch your sales team to out of this world performance.